You are here: Home > Shop by Manufacturer > Mundial Inc.
Mundial Magnetic Bar Knife - 18 in. Mundial Bread With Micro Serrated Edge Knife Handle White - 10 in. 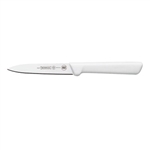 Mundial Cimeter Knife Handle White - 10 in. 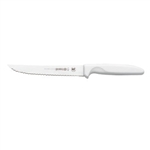 Mundial Serrated Edge Offset Sandwich Knife White Handle - 7 in. Mundial Chef's Style Forged Paring Knife White Handle - 3.25 in. Mundial Spear Point Paring Knife White Handle - 4 in. Mundial Santoku With Granton Edge Forged Knife White Handle - 7 in. Mundial Utility Serrated Edge Knife White - 6 in. Mundial Serrated Wide Sandwich Knife White Handle - 10 in. Mundial Pizza Cutter White Handle - 4 in. Mundial Spreader With Wavy Edge White Handle - 3.5 in. Mundial Steel Diamond Black Handle - 12 in. Mundial Steel Round Wood Handle - 12 in. Mundial Turner White Handle - 4 in. x 3 in. Mundial Turner Square End White Handle - 6 in. x 3 in. Mundial Turner Hamburger Wood Handle - 6 in. x 5 in. Mundial Turner Perforated White Handle - 8 in. x 3 in. Mundial Turner White Handle - 8 in. x 3 in. Mundial Mini Turner White Handle - 2.5 in. x 2.5 in. Spreader Straight Edge White Handle - 3.5 in. Round Tip Utility Knife Assorted Color - 4.25 in.